A brief trip home after completing a year of teaching. I needed to see Angela in Minnesota and finally visit Greg, who has been in New York for a year and a half. I was not very social. To make time for this visit, I had declined to sign another teaching contract, and I needed to come to terms with the transition this had initiated. I missed my dear colleagues, but not the hectic schedule, and wondered what might occupy me next. My life is a series of restarts. The weather, though overcast, was mild, and our house was in fine shape. No ice-encrusted roof, no invading mice (despite the absence of our cats). “We are having such an easy winter,” everybody exulted. A scant few inches of snow covered the ground, and roads were clear of ice. I watched a deer munch the brown grass outside my living room window one afternoon; perhaps he too wondered what season we were in. I no longer feel the need to stock up on American treats, but I bought a few — corn muffin mix, which I think Turkish friends will enjoy, and Buttermilk Ranch dressing for Sankar (nobody does “ranch” like Americans). I appear to have acquired some Turkish characteristics. First, I was cold whenever I was out of doors, no matter how balmy the temperature. It wasn’t that I believe (as Turks do) that a cold breeze can cause illness. The air simply felt uncomfortable, and I turned down several chances to go for walks. The second night I was home, Angela and I ate at a Tibet-Nepali-Indian restaurant in northeast Minneapolis. Our waitress was friendly and the food was good and reasonably priced. But I left feeling somehow bereft. It didn’t take me long to figure out the reason: nobody had been at the door to smile and wish me goodbye. This is standard at every Turkish restaurant, just like when you leave a friend’s house and your host bids you farewell. I chuckled at this new expectation, but caught myself seeking this ritual again and again. Seeing Greg in his new habitat was a treat. He has built a life for himself: a full-time job, an apartment with three congenial friends, a blog that is growing in readership. 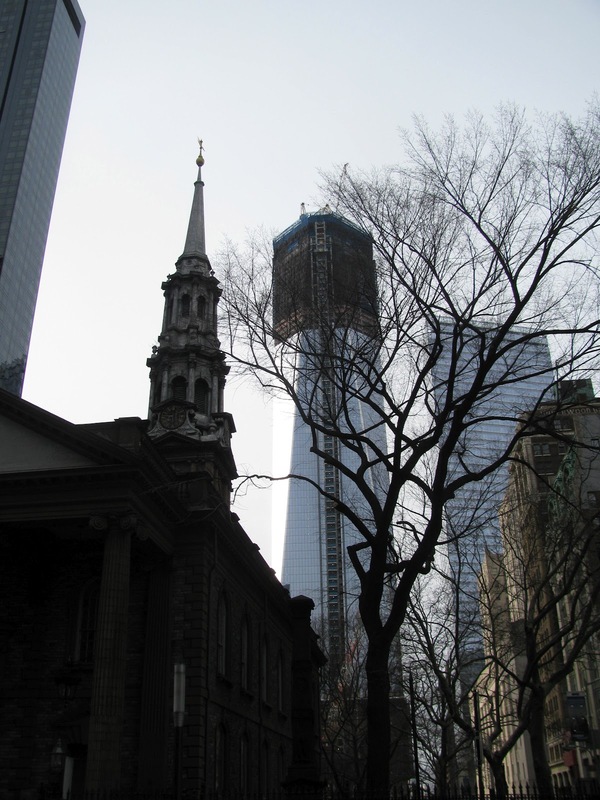 His neighborhood, Murray Hill, just east of the Empire State Building, is full of low brownstones and quiet commercial establishments that give it a village-y feel. A section with Indian restaurants is dubbed Curry Hill. Greg and I rode to the City Hall subway stop in lower Manhattan to see his workplace. His agency is the Office of Contract Services, and deals with all the vendors that do business with the city, from grass cutting and snowplowing to carving inscriptions onto memorials. a Japanese bakery (two words I seldom think of together) for delicious sweet rolls, and shopped for apartment necessities at Bed, Bath and Beyond. Soon the trip ended. I flew back on Turkish Airlines, reputedly Europe’s best carrier. Thanks to all of Sankar’s miles, I was upgraded to business class, and settled delightedly into a seat that reclined completely flat! The food was excellent, particularly the seafood and vegetable mezes (appetizers) served family style. 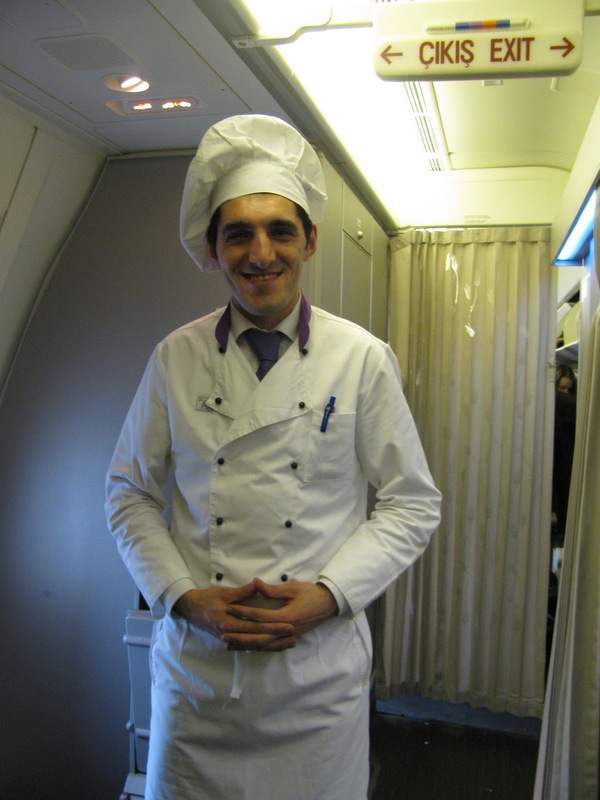 Turkish airlines has a chef on every flight. Ours was one of many Turkish men I’ve seen whose strong facial features could appear menacing, but instead translate as tender and caring. 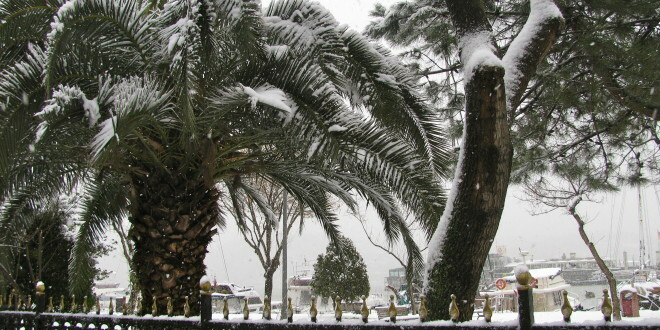 Back in Istanbul we’ve had three days of snow with more to come. Cars can’t climb hills, and pedestrians slip on icy inclines, so I am mostly homebound. The winter won’t last long, though, and soon I’ll be out exploring and enjoying to the fullest this most hospitable place. Happy to be back! No way is there that much snow on the boss! Hi Sue! Just read your comment on my blog! Thanks! I tried to reply right there but somehow it wouldn’t go through grrrrrr. But then I figured I could answer on yours and that was probably better. You can get choc chips at any big Migros and I expect any of the upmarket supermarkets here in Istanbul. And as for books: the one last week was Brixton Beach by Roma Tearne while one of our all-time favourites was The Glass Room by Simon Mawer. Do you know it?